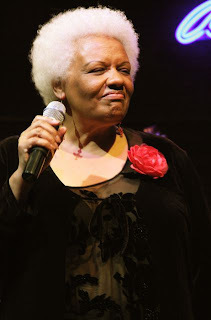 I love Barbara Morrison, and I don't just want to hear her sing. I want to be her girlfriend and go shopping and take long lunches with lots of wine, or maybe martinis. I'd hope she'd be in the mood to tell stories from her 30-plus years as an entertainer, performing with jazz and blues legends including Dizzy Gillespie and Ray Charles, Etta James and Joe Williams. I'd try to make her laugh because her laughter, like her singing and her stories, is such a pleasure. How many times have I seen her? Three, four, maybe five? It's been almost two years since she was last in the Twin Cities, as a headliner at the 2007 Summer Jazz festival. The audience for her second set at the Dakota on Monday was small. I was embarrassed for us as a community of people who are supposed to know something about music. As a friend said later, "There should have been a line out the door." I came home and stayed up late to write a review.